This is a brief overview of Martin Guitars 17 Series acoustic guitars. There are 6 different models in the 17 series – plus an alternative finish for each model. Each model has an option to have a “Black Smoke” finish or a “Whiskey Sunset” finish, depending on your aesthetic preferences. Being part of a series they have more similarities than differences – but the different options will appeal to different people. These names all sound quite similar but they’re fairly simple to decipher. I’m actually not entirely sure what the “S” stands for in the 2 12-fret models – but the only difference I can see (apart from being 12-fret and a different shape) is that they don’t have pickguards and the other models do. You could also say that there are only really 3 different models – each one has the option of electronics or no electronics, in addition to the color option. Prices in the series range between $1,999 and $2,549. All prices mentioned are in US Dollars and are the MSRP (Manufacturers Suggested Retail Price). Alright let’s take a look at each guitar individually. The 000-17 comes in 2 color options – Black Smoke and Whiskey sunset. It features a shortened 24.9” (632mm) scale length (as do all the guitars in this series) for ease of play. This model is in Martin’s 000 size – aka Auditorium, which is a little smaller than a Grand Auditorium but a little bigger than a Grand Concert. The only difference between this and the 000-17 is that it has built in electronics (Fishman Matrix VT Enhance NT1). It also comes in the two different finish options – Black Smoke and Whiskey Sunset. The main difference between this and the 000-17 is that it is in Martin’s 00 Slope Shoulder size – this is a grand concert sized guitar and is smaller than the 000-17. All other specs mentioned above for the 000-17 are the same. The table below shows the difference in size for the guitars in this series. This is the 00L-17 with built in electronics – the Fishman Matrix VT Enhance NT1 electronics like on the 000-17E model. This naturally raises the price too. This is a 12-Fret model (meaning that the neck joins the body at the 12th fret as opposed to the 14th Most modern guitars join at the 14th fret). Everything else, like the tonewoods, scale length etc are the same as on the other models. You guessed it! This is the acoustic-electric version of the 00-17SE. Martin Guitars 17 series features 3 main models – each with an option of electronics and without. The electric-acoustic models expectedly come at a higher price. Each model, including the electric-acoustic models, come with the option of either a “Black Smoke” finish or a “Whiskey Sunset” finish. So all in all, there are 12 options. 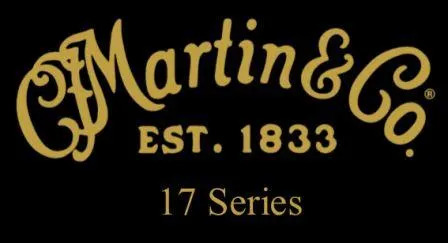 This has been just a brief overview of Martin’s 17 Series guitars but I hope this has helped you to visualize this series.